Within something like two minutes of meeting NPIRL'er Gary Hazlitt, I realized that I am going to want to warm my toes by the heat of his knowledge and - importantly - his marketing prowess... often and a lot. It is so very rare to find someone who is, at once, technically expert and savvy/hyper-innovative in the area of user-friendly branding. It isn't for nothing that Australia's 11-island The Pond (or BigPond) - which he masterminded and lead-created for Australia's communications group Telstra - is experiencing 12K+ visits a week (see Tateru Nino's analysis), and is the highest rated brand in Second Life. Even more endearing is the fact that Gary is a ginormous supporter and believer in the power of the Not Possible in Real Life (NPIRL) concept, and integrates it into his builds in fun, approachable and unexpected ways. * Sydney-based, born a Brit, lived in the U.S.
* ...is a busy blogger on SL and its culture, as well as role-playing which he says is a "big fascination of mine atm"
"I have been talking about over-representation for a long time ;-) - hence my interest in NPIRL. In other words too many malls, real world architecture, etc, etc. 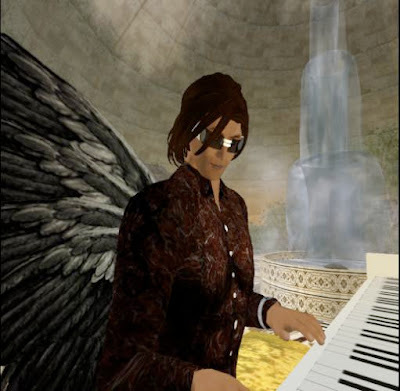 I have just posted a simple thesis on wikipedia about how the environment can help nurture inhabitants in SL to really dream and create their own fantasies, but most importantly share stories and experiences through places with total immersion. NPIRL ones, exhibit levels 3 and 4 where the environment itself has character and leads you into your story mode. Greenies is a great example, albeit a frozen moment. I am always trying to create fantastical and dynamic (things) so (they are) slowly morphing and exhibiting a different character and sensation at any given moment. Every time you go back you have a slightly different experience (and are) always able to uncover something new. (I) suppose that is the organic side to it... layers of depth to get under the surface; very few places like that but it should be, as creators, our goal to create things that feel like they have been here for years and centuries, even if they feel contemporary. I am a good friend of DanCoyote's (Antonelli) and his works have that sense of organic... of being created from the virtual earth... and are timeless vs - spits on the floor - copies of RL!" * PAUSE while this blog poster and yours truly thinks to herself: OMG, this guy sooo gets it! "(RL) has its place as I have to do lots of corporate builds, too, and although I would love them all to be floating, moving, spacious, ethereal - you have to create the equivalent of the vanity boardroom and such... that being a metaphor for things noobs from companies can recognise at the start." * PAUSE while this blog poster lowers head, genuflects and utters "amen"
"(We are) happy for people to drop in and - here is a main point with NPIRL type builds - is that they should be responsive to comment. (Important) that the builder and creators agree with the inhabitants who visit that any piece can be changed (to some extent) so it becomes a work of the SL community, too. We are very keen for folk to suggest changes, because we love to hear from those who have experienced it and say 'oh that would be great' or 'do this.' To me that is what the social network that is SL is all about... co-creation... so we really listen to comments and suggestions and mix that in with our intentions." Over the next two weeks NPIRL members will have the pleasure of previewing two of Gary Hazlitt's new build environments and learning his thoughts on them.